We are a Missionary Baptist Church who enjoys serving the Lord. We are so happy that you are visiting our website and pray that you will find all of the information helpful and inspiring. 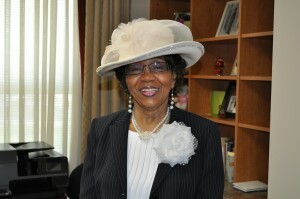 I am First Lady Doris L. Graham. I have been with the First Missionary family for 24 years and I am still rejoicing in the Lord for such a loving church who knows and serves the Lord. I was born in Chesterfield, Virginia. I am a graduate and post graduate of Coppin State University in Baltimore, Maryland with a degree in Elementary Education and a graduate degree in Educational Administration. After serving in Mt. Lebanon Baptist Church for thirty years, I moved my membership to First Missionary. I serve on the deaconess board and as President of the Board of Christian Education, where I work faithfully with 43 ministries. It is a joy to serve the Lord, but more rewarding to serve Him with a body of loving, kind, and God-fearing people. I am happy to work with my husband, Reverend William H. Graham in ministry. It is a blessing to be a help mate to this Man of God, while serving the people of God. In my journey for the Lord, I want to convey to all people that Jesus Christ is Lord. I want to use all my gifts and talents granted by God to glorify Him. My work in First Missionary is a walk by faith. Realizing that the people of this generation need to know the Lord and encounter the Holy Spirit, I am committed to spreading the word that Jesus Christ is Lord and the finisher of our faith. I extend a second welcome to you as you visit our website and invite you to come and worship with us. I pray that as you worship, you will encounter the Holy Spirit in a manner that your soul will be refreshed.